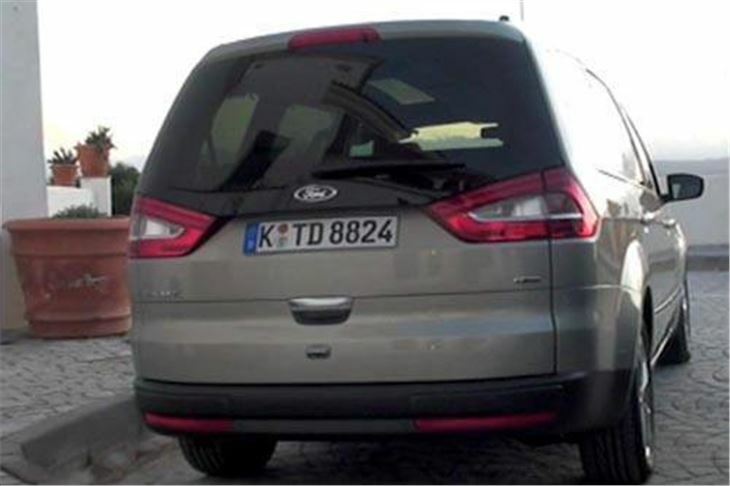 Back in May 2006, after 10 solid years with the old one, Ford launched its “All New Galaxy”. None of the new Galaxy was a carry-over from the old one. It wasn’t even made in the same factory. 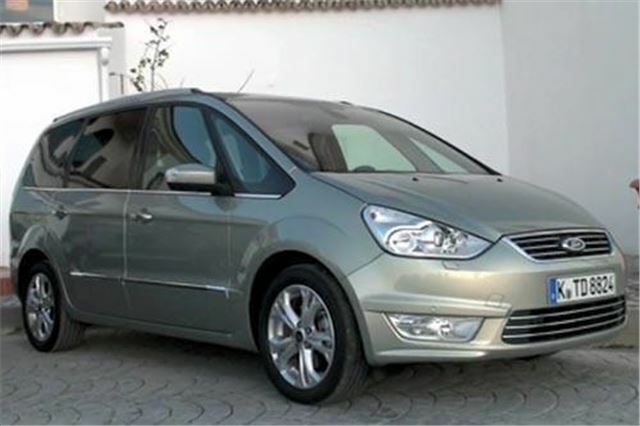 It had new engines, new transmissions, a new floorpan (from the then forthcoming new Mondeo) and it was and still is built in Genk in Belgium alongside the S-Max and Mondeo, instead of in Portugal along with the VW Sharan and SEAT Alhambra that shared almost everything apart from their badges. 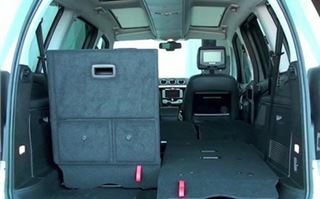 From many people’s point of view, the most important improvement was that to get stuff in you didn’t have to chuck the back seats out. They all fold up, all five of them, not quite into the floor but to become a slightly raised floor. They’re also all separate, individual, full-sized seats. And all five of them slide backwards and forwards. You can carry seven rugby players hundreds of miles without any of them having to scrum down. And you can even get their kit in the back behind them. 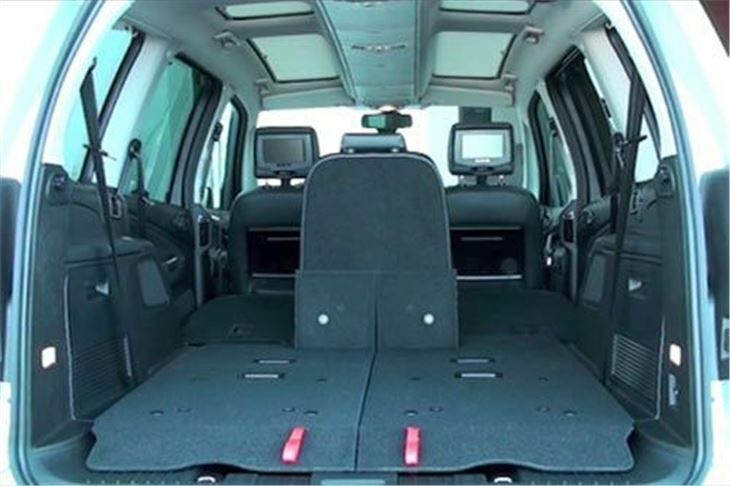 Or you could put a couple of kids in the rearmost seats, slide them forward a bit and have plenty of room for a family’s holiday luggage without having to fit a great big box on the top. Or you could become a part-time antique dealer, carrying sideboards from auction one day and little old ladies to their bridge schools the next. 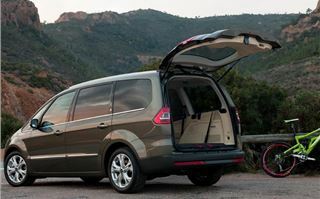 The wide opening doors and low sills make it as easy to get in and out of as a C-Max, and as comfortable on a long run. Obviously with a higher centre of gravity and a different job to perform, it’s not the seven-seater sportscar that the S-Max is. Ride is a bit softer, so roll understeer is greater. You can only push the laws of physics so far. Yet was still a decent drive considering the job it had to do. Smooth, comfortable, and on all but the twistiest roads it could be hustled along without biting back. If it lacked anything, the missing pieces were to be found under the bonnet. The 2.0TDCI was always respectable enough, though lacking in torque at low revs and a bit overgeared in 6th. The 220PS turbocharged Volvo engine was really too much for the Galaxy and the 2.0 petrol and near antique 1.8 diesel not quite enough. And the torque converter diesel automatic was a heavy emitter at 196g/km CO2. So now Ford has remedied the situation. You can still get the 145PS 2.0 litre chain cam petrol engine as before. But now, instead of the rather thirsty 2.5 5-cylinder Volvo, you can have a turbocharged variable valve timing 2.0 litre designated the Ecoboost SCTI that pumps out 203PS (200bhp) and a diesel-like 300NM torque, yet still offers 35mpg even attached to the 6-speed Powershift auto. This offers punchy power and torque. As much speed as an MPV driver should ever sensibly require. And no need to ever worry about changing gear. In fact, there isn’t any point in worrying about changing gear. You don’t get a paddleshift and don’t need one. Roll understeer soon shows you the vehicle’s limits. 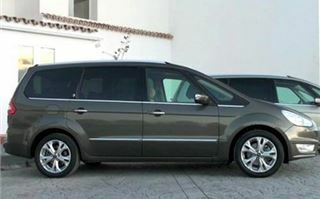 Yet the car can be hustled along easily as quickly as a Peugeot 5008 at very high levels of comfort. Not for the Powershift, VAG’s DSG’s occasional heartstopping hesitation when exiting sideroads or entering roundabouts. This box is virtually seamless. However, linked to the Ecoboost petrol engine, it does come at a price: 189g/km CO2 and the associated costs in BIK and company write-downs. So, sensibly, Ford has allied the Powershift transmission with 140PS and 163PS versions of its 2.0 litre diesel engine. 152g/km with the 6-speed manual. 159g/km with the Powershift (37g/km down on the old torque converter diesel auto). So now business drivers (and their wives or husbands) can have full 7-seater automatic that doesn’t hit them below the BIK. On top of all this, the 2010 Galaxy has been updated, Styling improvements include new low level LED DRLs that are unlikely distract other drivers or conceal the presence of motorcycles. The door mirrors have acquired Volvo’s bind spot warning system that works down to 20mph. There still isn’t any spare wheel, but now the Galaxy comes with a Tyre Pressure Monitoring system and optional runflat tyres. Ford’s Easyfuel misfuelling prevention device, seen on the Fiesta, Focus Mondeo and facelifted C-Max is fitted. There’s utterly foolproof steering wheel mounted cruise control with a speed limier that, very sensibly, can be overridden by flooring the accelerator pedal. Higher grade models have keyless entry with a start stop button. Go for the Satnav with Bluetooth and you get a reversing camera. 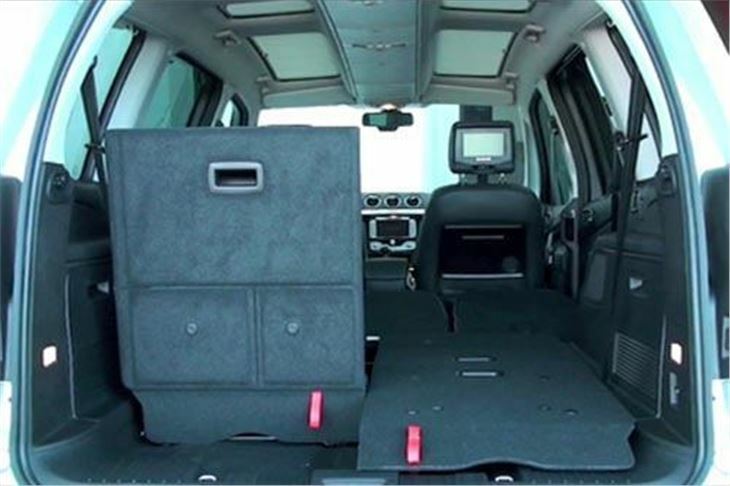 And there’s the option of a very high quality premium audio system. Basic levels of trim have now been dropped. 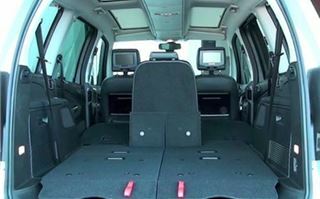 Opt for the Titanium level of trim and instead of comparing the car with Vauxhalls, Renaults, Citroens, Peugeots and VWs, you have to look at it against Audis, BMWs and Mercedes. 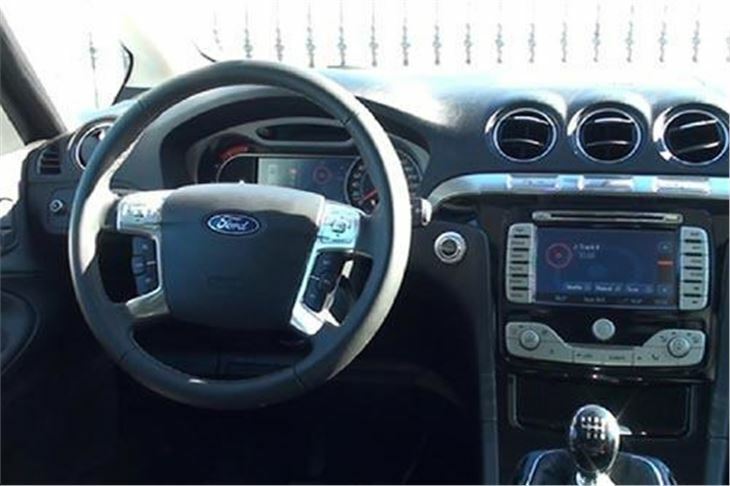 Fords have long been equal or better than these cars under she skin, but now the evidence is tangibly there in the ambience of the cabin and the quality of the trim. 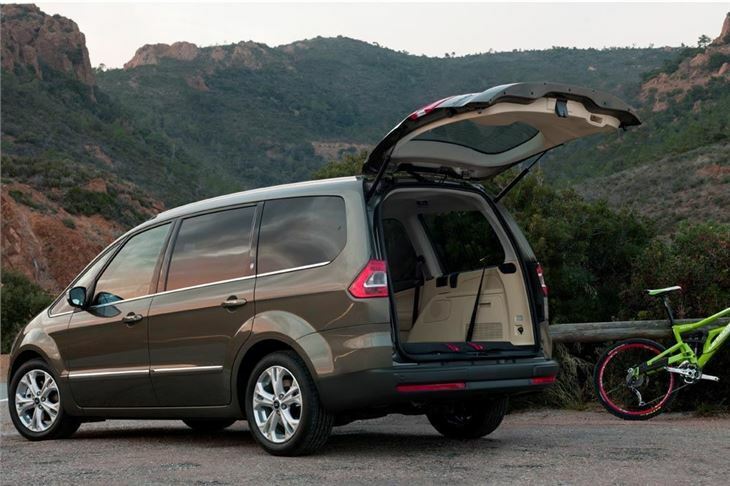 So, a decent driving and commodious 7-seat MPV has been refreshed. Most importantly with the option of a seamless automatic transmission with the diesel engines that remains under 160g/km. Families where the breadwinner has a company car can now seriously consider adding another member to the family.